I promised you a post on BB creams and in all honesty, what I know about BB creams can probably be written on the back of one. In other words, not an awful lot. Since then, I’ve been gathering snippets here and there from other Asian cosmetics aficiandos like Rowena, Kathi and ParisB (just a small selection of amazing blogs with an Asian beauty focus) and dipping my toe in the proverbial waters. The biggest complaint lodged against the Asian BB Cream market is the lack of colour variation and this still holds true 3 years down the line… for medium toned or paler skins, it’s not too bad. Darker skintones (with the exception of one or two products) are pretty much ignored in this genre. Speaking from a personal point of view, my pale pink skin isn’t as bothered by the oft-disliked ‘beige/grey’ tones found within many of these creams. Infact, I find that they cancel out my redness better than any other foundation or concealer I’ve tried but I can absolutely appreciate why they don’t look as good on olive or yellow-toned skintones. This one has the heaviest texture, it’s quite hard to spread and drags a little unless my skin is well moisturised underneath. The colour is good, though a tiny bit too dark for me. Skin-loving properties are based around whitening and calming irritated skin with Apricot Oil and Aloe Vera Gel. I would recommend this for normal/combo skins. The lightest in texture of the three I currently have in rotation. Best for drier skins, this leaves behind a medium coverage and a dewy finish. If you’re oily, you will probably hate this with a passion. It’s delicately scented and promises to be filled with ‘beauty enhancing’ ingredients like lecithin and Vit B to moisturise and nourish. Sadly, this one contains no SPF. The colour is less ‘beige’ (read grey) than the other two and will be better suited to warmer skintones (though it is still very light). My favourite and the one I’ve been reaching for recently is this offering from Taiwanese brand, Shills. With the highest SPF rating of SPF50 PA+++, it’s been doing a good job of keeping my skin protected in the sun. It promises to aid with whitening, wrinkles(!) and general skin improvement. It’s the palest of the three and the most suited to a cooler, pink skin tone. It covers my redness phenomenally well and is mid-way between the other two in terms of spreadability. Again, this one is delicately scented which may put you off. It glides on over a moisturised face but if you’re combo-skinned, you may not want to add that extra dewiness as this is pretty moisturising on its own. As you can see, these ones all come from the Asian marketplace but I’ll be interested to see how the bigger brands currently throwing themselves on the bandwagon will interpret the ‘genre’ for the Western market. I buy all my BB Creams on eBay but please be aware that there are fakes. Infact, I’m not certain that all my purchases are genuine (though I’ve thankfully had no adverse reactions) so do all your usual eBay homework, check ratings… compare products to stock images etc and if in doubt, ask questions! Have you tried BB Creams? Want to? I have a few BB creams on my eBay watchlist, I’ll add the Shills one to it because it looks like the one that’d suit me best! Thanks for the review and swatches, they can be so hard to find on these! Care to share what ebay seller. I am a MUA and I have done clients with skin tones similar to those swatched. I’m curious to check these out! I’d appreciate it! You’re welcome Erin, good luck with the auctions! I tried it in 31. I love hte dewy and soft feel. However, it wears off really fast and make your skin look blotchy once it oxidizes. I think it’s still a shade darker than NC 40. I don’t love it enuff to buy it again. I’m gonna stick to my mac. 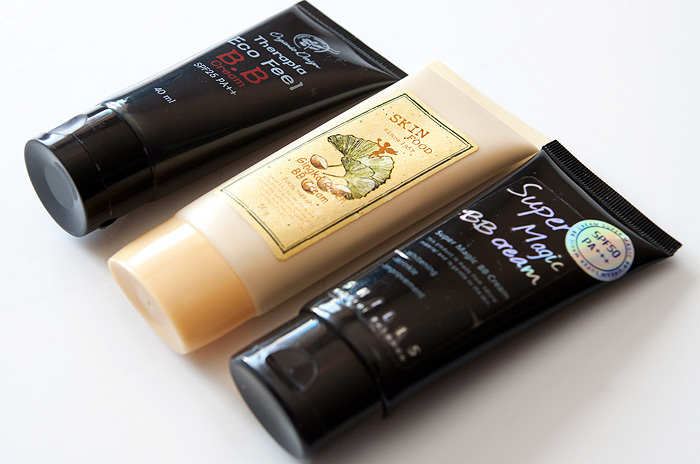 I’m totally fascinated with BB creams at the moment so this round up is perfect timing, great reviews! I’m a redhead my skin is paler than yours. I only use BB creams because they are the only ones that cater for my skin tone. I actually adore their grey-sh tinge because it tones down redness and sallowness. I’m currently using Skin79 Lovely Girl BB Cream and I adore it. It gives me perfect porcelain skin. Isn’t it fab to find something that you’re properly in love with? Now the weather is warmer I’ve been really enjoying rediscovering my small stash of BB creams. I’ve just bought another one too! I am really dim I know, but are BB creams like a tinted moisturiser but with skin care properties? If so these could be right up my street! Will have to google BB creams and see what I can find out. They’re a bit heavier than tinted moisturisers… I’d say the ones I’ve tried are medium coverage so perhaps a touch heavy for you? Though I’m sure they can be mixed with your moisturiser for a lighter finish. I think you’d like them though Debbie, they really even out my redness and leave a dewy finish. Wow! It is superb. I used this product. it is very effective for skin. Thanks for sharing..
I’m so disappointed that these are actually so good as having lived in Asia I had the easiest of access to them and now that I know about them I am back here in the UK! I might check Ebay for Shills though, sounds the best of the lot. Yes, can’t wait to see the reviews for it! What a useful post, thanks! I’ve been interested to try one and since I’m pasty I’d been a bit nervous about ending up with a product that made me look tango’d. I’ll give the shills one a go. Thank you, I’m glad you enjoyed it! You definitely won’t be tangoed with the Shills, hope you like it! When I first got interested in Korean pop culture, I was really intrigued by BB Creams – but as soon as I asked around and realised that they all come in this one shade, no thanks. I don’t see the point of mixing it in with my foundation so that I don’t look ridiculous and I don’t have problem skin anyway so it’s not like I’d need the miraculous benefits they claim to have. The weird thing is, it doesn’t even match all of the general population of these countries…you see some Korean celebrities wearing them and looking either purple or way, way too yellow because the undertones of some brands are oddly pink and it contrasts with their natural skin colour. If it doesn’t even fit all Asian skin tones, I have no hope 😛 So yeah, if they want to get their hands on some of my finest English pounds, they can make it in a nice chocolatey shade. There is one that seems kinder to darker skintones but I’m not sure if it’s well-liked… we need MOAR! I can’t try BB creams, ’cause I can’t find any that cater to my skin tone. I’m really intrigued by these, but a bit scared of buying fakes with god knows what in them on eBay. My favorite BB to date (I’ve tried about 6ish varieties) is Missha Perfect Cover in the lightest shade- I believe it’s #13 Milky Beige. For pale pale girls, it’s the lightest tone I’ve seen, and doesn’t have that bisquey grey cast to it. I’m also very interested in illamasqua’s version, which should be out by the end of this month! I quite like the bisquey grey cast! (beautifully put btw) – I’m gonna have to give this one a go I think! I actually have a order from Missha coming soon. I live in the U.S. so I got it on misshaus.com. because my skin is darker and they say that one of the BB creams in #31 suits NC40 in MAC really well so hopefully it’ll work for me. I just bought my first BB cream (Missha Perfect Cover in No. 23) and I absolutely love it! My skin is medium with yellow undertones and quite oily. I wore it to go out this afternoon and it stayed perfect until about 10 minutes ago when I took it off. There was minimum shine and it also contains SPF 42. I bought it online from a company based in the Netherlands, http://www.bbcreamshop.eu, with which I am not affiliated in any way. It saved me the hassle of having to trawl through the listing on eBay. That’s really good for reference, thanks Anna… I just picked up #21 (same brand) – hope I like it! Thank you for the mention Charlotte! Very thrilled 😛 I’m still mostly on the fence about BB Creams but there’s one that I might be raving about (after a few more goes to confirm). Lots of western brands have come out with them too – Dior, Estee Lauder, Clinique, Bobbi Brown… some are hit, some are sadly a miss. I’m dying to try a BB cream but I haven’t read a review for one (that’s readily available to me) that has really grabbed my attention and made me think THAT’S the one for me… So the search continues. Where in Asia can I buy these creams? I’m going to Hong Kong, Kuala Lumpur and Singapore in Sept. Will I find any there? Anyone any ideas??? Politely butting in: Depending on the brand, you can find BB Creams in most pharmacies here in Kuala Lumpur (Look in Watson’s) and also Sasa stores or if from Korean brands, you can find some Korean skincare stores here too. Ditto Singapore. In Hong Kong, its even easier to find them (Sasa, Bonjour, cosmetics stores etc) For western brands, you can get Estee Lauder, Clinique, Bobbi Brown and Dior at counters and also at the Airports. I’m not sure about MAC but I know its available at duty free. Where to find them depends on which brand you are looking for. Hope this helps! I love the idea of BB creams but know they will not suit my NC44 skintone, such a shame.. Yes, you’d really struggle trying to find a decent match… perhaps with the major players starting to delve into the market they’ll be more choice for darker skintones, here’s hoping! Haha, how jel am I?! Hey, I’ve been a passive reader for awhile now. Just wanted to comment on the BB cream bandwagon cause I’ve used a couple of them before. BB creams sound amazing because they sound like they do everything, but from personal experience, it could also easily wreck your face if you have sensitive acne-prone skin like mine. The biggest culprit was Missha Perfect Cover because it contains a good dose of mineral oil in its formulation; it caused me to develop awful cystic acne. Part of the allure with BB creams is that it’s supposed to be good for acne prone skin, but this isn’t always the case. Please be careful when trying out new BB creams, especially if you have acne prone skin! Try to find out what ingredients there are before buying any. I’ve just bought the Missha Perfect Cover :/ I’ll make sure to try it when I have no special plans for the week! Thanks for the warning. I’ve noticed that a lot of Missha products contain alcohol, Mineral Oil or some form of paraffin in their products, even in their acne and pore care products. My skin tends to break out easily and MO tends to aggravate my skin, so I’ll be avoiding some of their products. I love bb creams because they are very convenient. I fall in the medium tone category and am lucky that most bb creams fit my shade. I am using Dior BB Cream at the moment. I really love it. It fits my skin tone perfectly and has great oil control. My skin feels soft and supple after I take it off. 1. am i going to have reactions to this like some people did and make the skin worse? 2. is that going to really do something for my blemishes? Had never heard of BB creams until your post, so I went straight online, researched, then eBay and purchased Skin79 Hot Pink (as I believe it is better for oily skins?). I’m hoping it’s not a fake! Packaging looks genuine and seller has good rating. The colour suits my fair skin very well and I always wear powder over the top of my base to try and keep oil slick at bay (though an hour later it always breaks through no matter what products I use). Thanks for introducing me to this, it’s ideal for summer with the SPF. Thanks! this was really helpful! I’ve been looking for the right BB Cream for me for so long! Can you do a review on Skin79 Dream Girls BB Cream please? I have tried a sample of the Garnier BB cream which is now heavily advertised, and found it to be really good. I just used a little though.